White House confirms President Trump will meet Prime Minister Netanyahu in New York next week. President Donald Trump will meet with Israeli Prime Minister Binyamin Netanyahu next week in New York, the White House said Thursday. 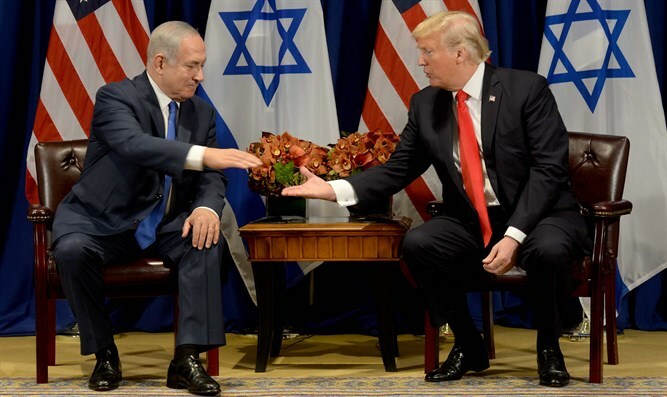 According to Channel 10 journalist Barak Ravid Thursday night, the White House has confirmed that President Trump will meet with Netanyahu in New York on Wednesday, September 26th. The meeting between the two leaders will take place on the sidelines of the opening of the 73rd United Nations General Assembly session in Manhattan. President Trump will also meet with Egyptian President Abdel Fattah el-Sisi, the White House said. The president is also expected to meet with leaders from South Korea, France, Japan, and the UK during the UN General Assembly’s annual event. Palestinian Authority chief Mahmoud Abbas has invited dozens of foreign representatives for his own gathering during the General Assembly session opening. According to the PA representative in the United Nations Riyad Mansour, Abbas has invited 30 diplomats and United Nations Security Council representatives to the meeting on the sidelines of the General Assembly event. According to Mansour, the meeting is intended, in part, to address what he called the “radical shift” in US policy vis-à-vis the Middle East that has occurred under the Trump administration.